Sierra One-Page Portfolio WordPress Theme is easy to use one page wp template. With very little modification, this flexible, responsive WordPress theme can be used to create Agency website, Freelancer, Photography, Creative, Fashion, Magazine, Blog website. Sierra comes with Revolution Slider making it easy to create cool slides in the header. Sierra One Page Parallax Creative Portfolio WordPress Theme comes in dark and light version and it’s great for everyone who want’s to easily create great portfolio website. 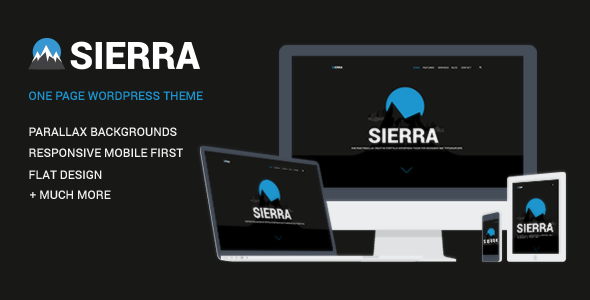 Sierra WP theme uses Visual Composer packed with custom shortcodes designed for Sierra template. We have paid close attention to responsive versions of this theme and we have designed fully responsive website that has the same functionality as the full screen version. A unique feature is a multilayer parallax effect that enables you to create amazing and creative header. Multi layer parallax is easy to set-up or to modify. Simply replace the images in multi-layer parallax and you are good to go.